In May & June, 2002, Michael had the incredible opportunity to record some of his music onto a CD. In 2013, CDBaby made the music available on the Internet! (You can also look for "Krigline" at iTunes, GooglePlay and other music sites.) Words cannot express our gratitude to all the musicians and others who volunteered countless hours to bring this dream to pass. If the technology works like it is supposed to, you can listen to parts of the songs by clicking below! (Left) Here is the “band” as they appear on the CD cover. Twelve musicians from 11 different countries volunteered to help! 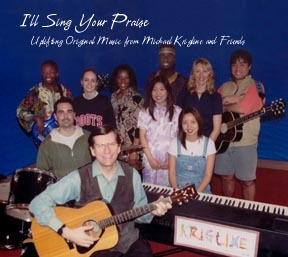 (Right) This photo was also on the original CD-mailer. Cherry was a fellow teacher at SIS. Her instrument is called an “erhu.” You can hear Cherry and her erhu in the song "Jing Ye Si" (see below). This project was born here, at the Heng Shan International Church where all the foreign musicians met. Tony in front of his wonderful recording equipment. You wouldn’t believe what this software/engineer team can do! The “choir” sounded great and showed that many of these songs are easy to sing. In May & June, 2002, Michael had the incredible opportunity to record some of his music onto a CD. Words cannot express our gratitude to all the musicians and others who volunteered countless hours to bring this dream to pass. If the technology works like it is supposed to, you can listen to some of the songs by clicking below!  If you somehow stumbled onto this site or the CD and now want to know more about the Kriglines, you should be able to find your answers on this website. Michael is an English teacher who also just happens to write music. In Shanghai, our friends kept asking for copies of the music, and thus the idea was hatched to record it. The project was far more expensive and time-consuming than we could have dreamed, but it was also a lot of fun. Most of the songs on the CD even turned out pretty nice—considering that we were all a bunch of amateurs! 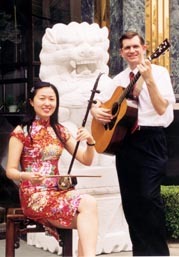 Her instrument is called an “erhu.” You can hear Cherry and her erhu in the song "Jing Ye Si"
Michael got to teach and sing every few weeks at the Intl Church (and also at retreats like this one), and people kept asking us to put the songs on a CD. We were in the studio about 50 hours. Sometimes Vivian and Andrew acted as our caterers! Did somebody say McDonalds? Dwayne Engh was our Producer, drummer and choir director. His wife Lynley did many backup vocals (and waited for us a lot!). Michael discovered that glasses and headphones don’t go well together! When it was all over, we hosted a banquet to celebrate and thank all the volunteers! If you have already got a copy of the CD, read the insert and you will see that you are welcome to copy it for your friends! Otherwise, you can only get copies from us—and almost all of the original 600 copies have been distributed! If you live near us in China, you can ask us for a copy; if not, write to me and I'll tell you how to get one. If you want a copy of the guitar chords for any of the songs (or if you want permission to re-record a song yourself), write to me (see below). I can attach the chords via a MS Word file when I reply. I would also be happy to answer questions about what the songs mean. Since I am generally busy teaching, please be patient! If you do not hear from me in a few weeks, ask again—sometimes e-mail never gets to us here in China. When I had barely learned any Chinese, our teacher told us to memorize this famous Tang Dynasty poem (about homesickness). I had to set it to music in order to succeed! Our Chinese friends asked me to include it on this CD. Don’t Cherry's erhu and voice sound beautiful! Silver moonlight spread alongside my couch. That confused me as frozen dew. Raising my head I saw the bright moon hanging in the sky. Bowing my head I reminisced about my home far away.